CONGRATULATIONS #CHRCMen, #CHRCWomen and #CHRCNegativeSplits! Despite the cold weather, the sun was shining brightly in Washington Heights and our team made a strong showing at the first club points race of the year. #CHRCMen, led by James and David with their sub-20minute performances, scored in 21st place! #CHRCWomen were led to strong finish by our seasoned athletes, Tara and Kristen. We have a lot to look up to in both of you! Come and hang out with all your running buddies for a couple drinks and meet some new royalty! Washington Heights Race Participants, come celebrate your victory! The third edition of Joe’s dose of strength and conditioning for distance running is this WEDNESDAY MARCH 8. Joe, a former personal trainer and Crossfit Coach, will lead us through some fun and a little competitive team based workouts that will help you get ready for the trails, make you injury proof, and develop that third gear for when you need to dig deep. Meet at 7:30pm at the GAP entrance to Prospect Park at the bike racks next to the stone gazebo on the left side looking at the park. We will be doing some things on the ground so bring gloves if you want. In April, a contingent of #CHRCTrails will be running the Breakneck Point Trail Half Marathon and Marathon. In preparation, they will be making a couple trips up to Beacon for some practice runs starting this Saturday. All CHRC members are invited to join in on these trips. Please RSVP and get the details on Facebook or by emailing contact@crownheightsrunningclub.nyc. Registration for the 2nd running of The Brooklyn Mile is now open! 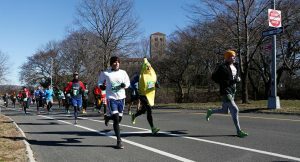 We are so proud that our close friends at Girls On the Run: NYC are the featured non-profit beneficiary for the event. 100% of donations will go to the charity.